On our last road trip to Arkansas, we returned home a different than we usually drive. The purpose of the diversion was to visit the Mildred B Cooper Memorial Chapel in Bella Vista Arkansas. This site was designed by E Fay Jones, an architect from Arkansas who was an apprentice of Frank Lloyd Wright. The chapel is open to visitors when there isn’t an official function happening and as luck would have it, there wasn’t a ceremony that afternoon. In fact the place was deserted! Upon arrival there was a small group of Asian tourists leaving as we entered the chapel. I set up my tripod and snapped a few shots. 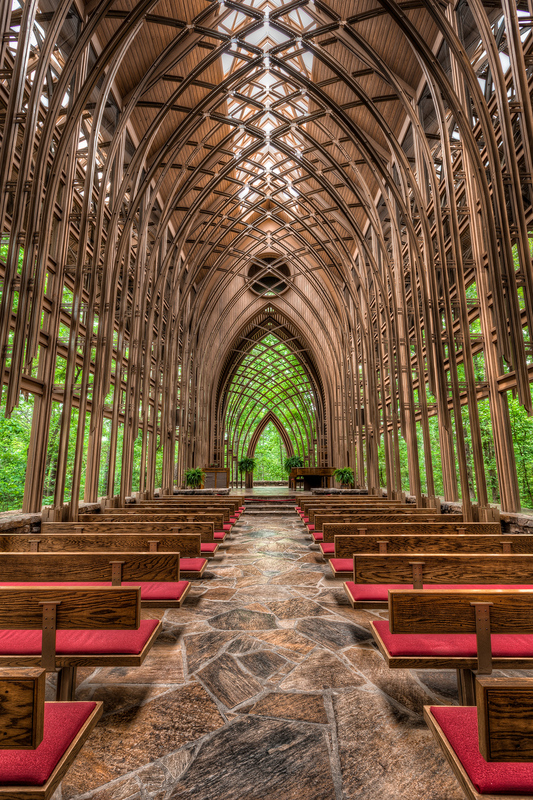 The chapel is glass…lots and lots of glass. The woods of oak and pine surrounding the chapel envelope you when you are inside and out. 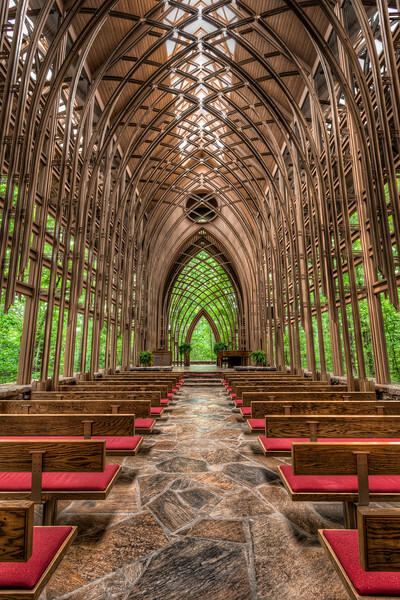 You feel like the chapel is part of the Ozark woods and the woods is part of the church, the separation is perhaps an illusion. If you happen to need a beautiful place for a small ceremony and are close to Northwest Arkansas…this is a beautiful location. This is a three shot bracket (-2, 0, +2) combined in Photomatix, edited in Photoshop and Lightroom.